Another name is being floated for the Akira remake. David Leitch talks about what might have been with one potential Cable for Deadpool 2. Annabelle 2 gets a name change. Plus, new pictures from Wonder Woman, good news for The Santa Clarita Diet, and a new look at The Flash’s return next month. Spoilers now! 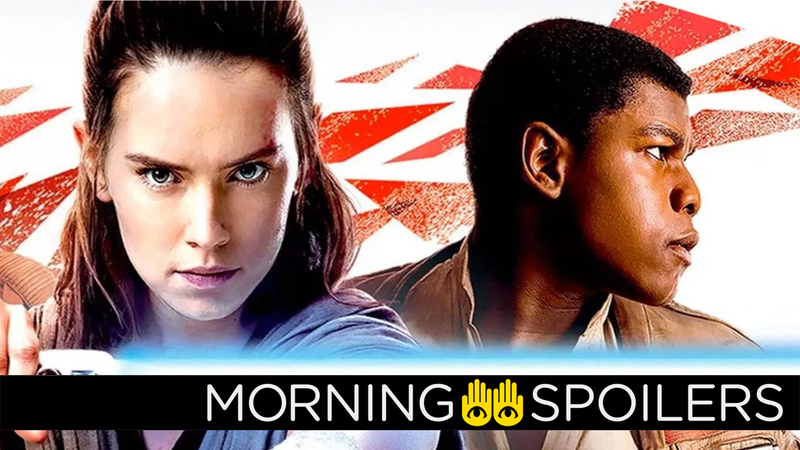 Perennial rumor hounds Making Star Wars have an intriguing new report about the strange “Force Tree” spotted in set pictures last year for filming scenes set on Ach-To, the planet Luke and Rey are on at the end of The Force Awakens. Apparently, the tree, of significant Force sensitivity (and perhaps linked to similar trees seen in Clone Wars and Star Wars: Shattered Empire as important, Force-powered plants), will be laid low at some point in the film, engulfed in flames thanks to the work of a mysterious agent. The site speculates that the attack on the tree may be done by Kylo Ren in an attempt to bait out Luke Skywalker—we know Kylo and his knights will appear on the island for a major action sequence, and we also know that Kylo is a fascinatingly petty little brat, so burning something down for shits and giggles to annoy someone else seems like a totally on-point thing for him to do. Jordan Peele is now the latest name to be added to the potential roster, according to The Tracking Board. Director David Leitch told Comicbook.com that Brad Pitt is no longer in the running to play Cable. Obviously everyone wants to see Copycat. I have no idea if that’s something they have in the works or not. Showbiz411 reports Jeremy Renner is “too busy” filming the next two Avengers movies to appear in M:I6. However, the site also reports Renner is rumored to appear in the Ant-Man sequel, too. Speaking of Hawkguy, Renner just Tweeted a photo of himself en route to the Avengers set. IMDB has just listed the film’s running time as an astronomical 170 minutes. Good lord, that’s a lot of justice—but considering it’s IMDB, it’s probably not entirely accurate, and you’re better off waiting for another source. Two new photos have arrived of Wonder Woman palling around with Steve Trevor and company. Director David F. Sandberg has revealed the title—and logo—of Annabelle 2 in a video posted on Twitter. The gang throws a huge celebration canvassing every major holiday, but Tandy and Todd’s bro-mance hits a rough patch that threatens to end the fun. A teaser for the second trailer, arriving later today, has been released. Good news — Netflix has renewed the series for a second season in 2018. Here’s a trailer for the show’s return episode, “The Once and Future Flash”, premiering April 25th. In related news—as many outlets are speculating—we’d also like to note that DeVoe, the unfamiliar “great villain” of the Flash that Abra Kadabra taunted Barry with this week, is a reference to Clifford DeVoe, a.k.a. The Thinker—a Golden Age surpervillain of Jay Garrick’s. To help Clive (Malcolm Goodwin) solve the murder of a lifestyle guru, Liv (Rose McIver) consumes his brain and takes on his zen approach to life. Ravi’s (Rahul Kohli) old boss, Katty Kupps (guest star Christina Cox), is getting closer to discovering the truth while also getting closer to Ravi. Meanwhile, Blaine (David Anders) and Peyton (Aly Michalka) continue their budding friendship, much to Ravi’s (Rahul Kohli) dismay. Lastly, Major (Robert Buckley) is struggling a bit at his new job. More pictures from the episode are available at KSiteTV. Finally, here’s a poster for the show’s return on April 4th, a “What If...” teasing Professor Coulson and something called “The Cambridge Incident”.